91.1 The Globe has been named a finalist for the “Best College Station in the Nation” award for the ninth consecutive year. 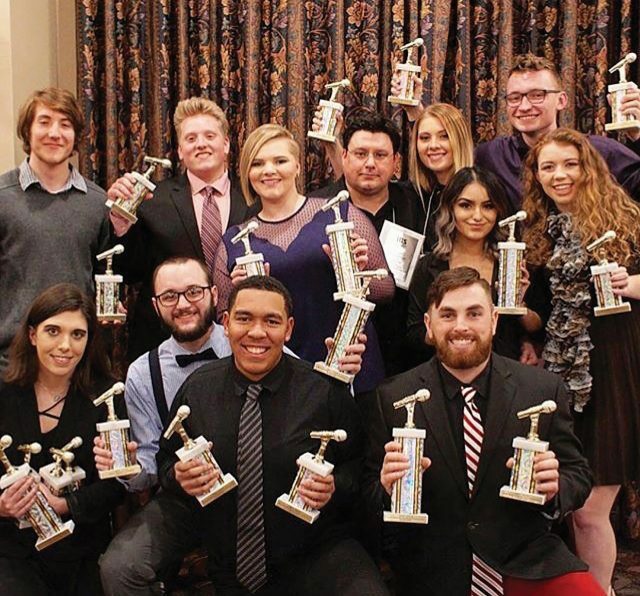 Along with Globe TV and FiveCore Media, the three Goshen College media outlets have been nominated for a total of 34 national awards in the 2019 Intercollegiate Broadcasting System (IBS) College Media Awards. 15 students, two faculty members and one professional staffer were named finalists for the awards, which will be presented at the 79th International IBS Conference in New York City on Saturday March 2, 2019. “It’s a big deal really,” said Kyle Hufford, assistant professor of communications. “It’s the longest running collegiate broadcasting organization in the country and the longest running convention.” Hufford is a finalist for Best Faculty Advisor, Television, for his role as the executive producer of Globe TV. Senior Laura Hoover and sophomore Kadie Spoor led nominations with five apiece. Other students nominated were 2018 graduates Riley Mills, Tabitha Immanuel, Tim Litwiller and Brad Stoltzfus; juniors Riley Friesner, Karen Ramos, Alyson Prigge, Greta Neufeld and Bryce Stopher; sophomores William Troyer, Zac Begly and Brandon Roe, and freshman Jeremiah Sherrill. Professor of English, Jessica Baldanzi, was nominated for her Sunday night show, Could Lead To Dancing, in the Best Community Volunteer Program category. David Kempf, staff member and 2009 GC graduate, was nominated for the Tom Gibson Award which is given annually to the nation’s top college radio engineer. The station staff were nominated for seven additional awards: Best Logo, Best On-Air Giveaway, Best Overall Sports Coverage, Best Station Playlist/Music Selection, Best Staff Training Method, Best Radio App, and Best College Radio Station. The award nominations come just over a week before the official launch of Globe TV, a new website and broadcasting rebranding. Globe TV will consist of Globe News and Globe Sports. The official launch will take place on Monday, Feb. 11, with an open house scheduled from 3:00 to 5:00 p.m. in the newly refurbished 4K television studio in the basement of the Good Library. New sets have been designed and built in the 20 year old studio to film “The Globe News Report” and “The Globe Sports Corner.” New technology has also been introduced to make it the only 4K TV studio in Goshen College’s athletic conference. Students will now be able to work with new 4K ultra high definition cameras, LED studio lighting and control room technology. “It’s quite a big difference from what the students were using last year,” Hufford said. Globe News will add weekly video stories that will air on GlobeRadio.org. “The Globe News Report” will recap the months best stories. For Globe Sports, “The Globe Sports Corner” will air each week and consist of in-depth video features and interviews with athletes, coaches and administrators, as well as cover Maple Leaf athletic competitions. Hufford explained that the main reason to rebrand now was to add the TV broadcasting component and update The Globe’s website. After recently celebrating the 60th anniversary of The Globe, Hufford explained how the remodeling and launch is the first step towards the future of Globe Media. “The next 60 starts now,” he said. 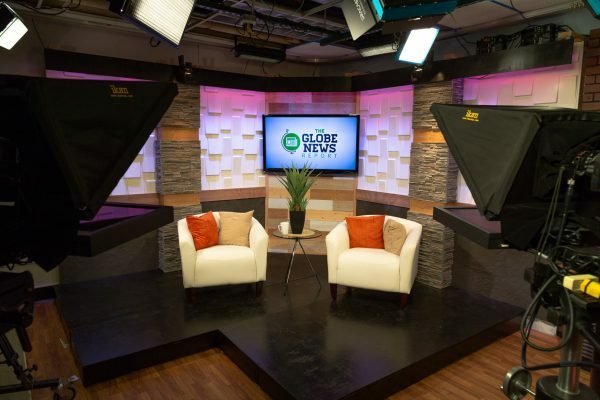 The newly renovated Globe TV station space.